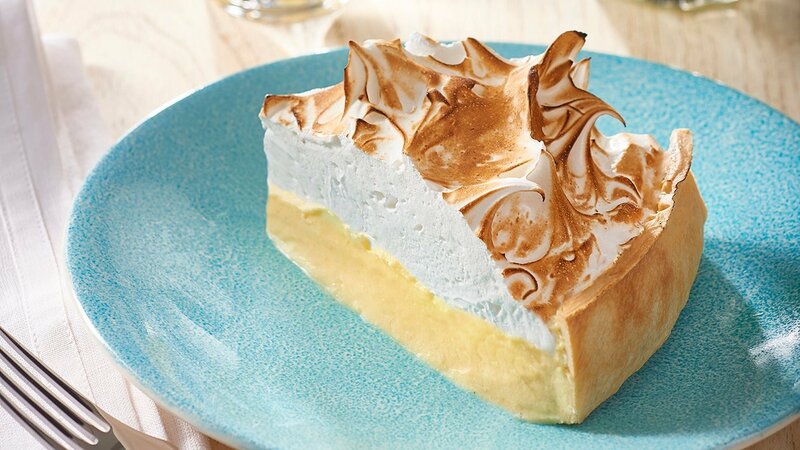 Fluffy sweet marshmallow, tangy lemon and crisp pastry. Whoever invented this recipe was a genius! Line a greased flan tray with the pastry and blind bake in the oven at 160 degree Celsius until cooked. Remove from the oven and allow to cool. Bring the cream to the boil and whisk in CARTE D'OR Crème Caramel/Crème Brûlée Dessert Mix and CARTE D'OR Pannacotta Dessert Mix before adding the lemon juice. Pour the lemon-flavoured mixture into the pastry case then refrigerate until set. Beat the egg whites to medium peaks and slowly add the sugar until a soft meringue is formed. Pipe the meringue over the tart and colour with a blow torch. Serve cut into individual portions. The base in this recipe is also perfect for a cheesecake.